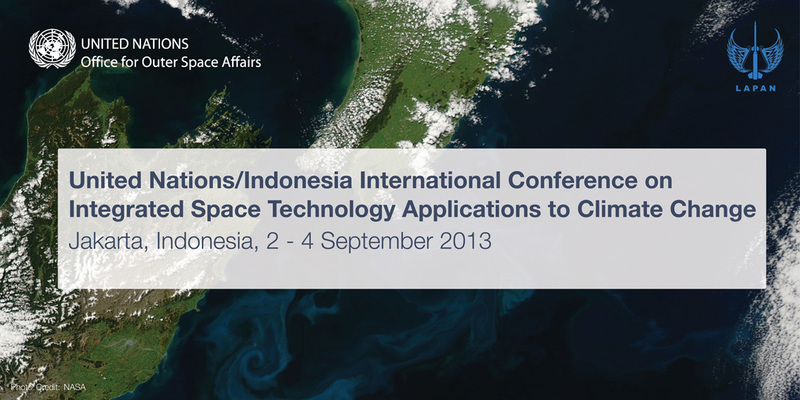 The United Nations organized the United Nations/Indonesia International Conference on Integrated Space Technology Applications to Climate Change under the framework of the United Nations Programme on Space Applications. The Conference took place in Jakarta, Indonesia, from 2 to 4 September 2013, at Borobudur Hotel, hosted by the National Institute of Aeronautics and Space (LAPAN). This International Conference brought together experts from the space and the climate change community as well as decision makers to discuss methods to use space-based applications to support the identification and implementation of adaptation measures, as well as to share experiences and lessons learned on the use of such applications in the context of mitigation. “Adaption” was centered as one of the cornerstones for a strengthened future response to climate change in the Bali Action Plan, adopted at the Conference of State Parties 13 (COP 13) in December 2007. In focus is the sustainable and continuing cooperation and achievements in order to effectively and entirely strengthen the implementation process of the Framework Convention on Climate Change (UNFCCC) beyond 2012. During COP 15 in Copenhagen the Conference took note of the necessity to create a comprehensive adaption programme. The signatories, among them Heads of State, Heads of Government and Ministers, agreed that urgent action and global cooperation on adaption is needed. Finally at the Cancun Climate Change Conference in December 2010 the parties agreed upon and created the Cancun Adapation Framework (CAF) with the focus of improving and emending actions on adaption. Important fundamentals of the CAF comprehend a work programme to address loss and damage from climate change, preparation of National Adaptation Plans by the Least Developed Countries, and the formation of an Adaptation Committee within the UNFCCC. In December 2011 the parties improved the implementation of the CAF by agreeing on: Modalities, procedures and composition of the Adaptation Committee; Activities to be undertaken under the work programme on loss and damage and Modalities and guidelines for the national adaptation plans. United Nations/Indonesia International Conference on Integrated Space Technology Applications to Climate Change will bring together representatives from the space and climate change communities; from Member States and from national, regional, and international organizations to become aware of the most recent advances in the use of space applications to target the challenges posed by climate change and to discuss strategies to improve the utilization of such applications particularly in countries experiencing the impacts of climate change. 1) To discuss ways in which countries affected by climate change can make better use of space applications to assess to climate change. 3) To improve synergies among space agencies and organizations targeting efforts on climate change. 4) To strengthen international and regional cooperation in this area. 5) To raise awareness on the recent advances in space-related technologies, services and information resources which can be use to assess the impacts of climate change and the effects of measures implemented to reduce such impacts. Government agencies including ministries of environment, health, natural resources, space agencies. National, regional and international organizations involved in climate change studies. All Conference presentations are available on UNOOSA's website.